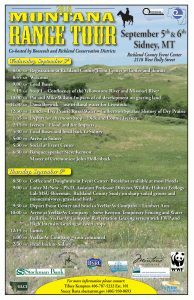 The 2018 Montana Range Tour will feature a great lineup of ranches and farms showcasing conservation projects and creative solutions to common ranching issues; there will also be talks on topics such as grassland songbirds, oil development on grazing lands, and the recovery process following floods and wildfire. Also featured on the tour is a lunch stop to learn about Dry Prairie Rural Water, which is vital to life on the range in Eastern Montana. This year’s tour will take participants around the Sidney and Culbertson areas on Sept. 5-6, 2018. A banquet with keynote speaker Steve Kenyon will take place on the evening of Sept. 5 at the Sidney Event Center in Sidney, Mont. This year’s tour is sponsored by the Richland and Roosevelt Conservation Districts and the Montana Rangeland Resources Committee. For more details, including a full two-day agenda and registration details, visit http://dnrc.mt.gov/divisions/cardd/conservation-districts/rangeland-resource-program. Online registration is also available at www.eventbrite.com.